Papercrafts by Patti: Wedding Wishes--With or Without? I made this card over the weekend for a wedding. It began as on the left, but then I had an idea to add the sheer ribbon on the right. Which do you like better? Let me know in the comments section. The wedding isn't for a few weeks, so I have time to decide!! Here you can see a close up of the Copper Foil Sheet rose and the Copper Embossing on the Rose Wonder sentiment. I like how it looks against the Soft Sky card stock. Thanks for looking. 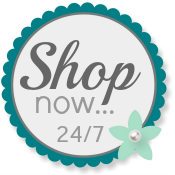 Don't hesitate to use my Online Store to place your order for Stampin' Up! products. The copper foil and embossing are gorgeous. Both cards are pretty, though I think I prefer the one without the ribbon. The happy couple will be thrilled to receive either one.